Dena Pearlman Wins the $500 No-Limit Hold 'em at the Foxwoods World Poker Finals! 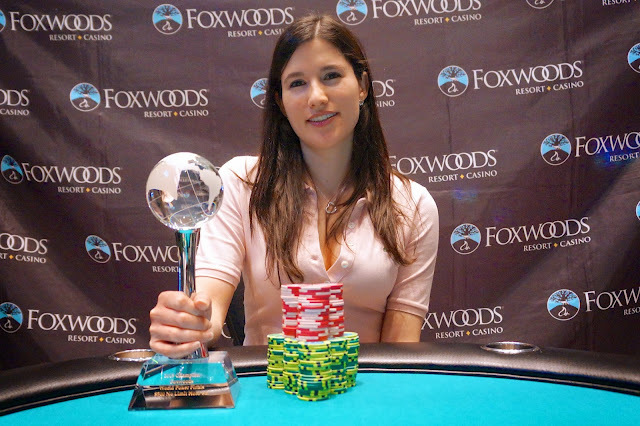 Congratulations to Dena Pearlman, champion of the $500 No-Limit Hold 'em event at the 2013 Foxwoods World Poker Finals. The final four players came to an agreement on a chip chop that gave chip leader Pearlman $18,029 and the World Poker Finals trophy. We had a total of 75 entrants win the $400 Pot-Limit Omaha High at the Foxwoods World Poker Finals. The final nine spots will finish in the money with first place taking $7,639 and the World Poker Finals trophy. There are currently 23 players remaining. 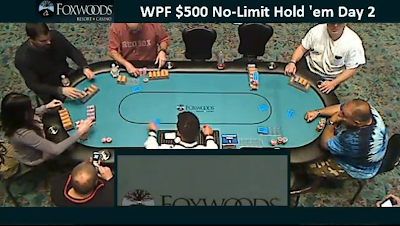 We have reached the final table in the $500 No-Limit Hold 'em Event #4 at the Foxwoods World Poker Finals. Peter Campo current leads the field with 829,000. Blinds are currently 6,000-12,000 with a 2,000 ante. We had a total of 186 entries in the $500 No-Limit Hold 'em Seniors event at the Foxwoods World Poker Finals. The final 24 players will finish in the money with first place taking $19,172 and the World Poker Finals trophy. There are 131 players currently remaining. Feature table of the $500 NLHE now streaming live with 18 remaining. We are down to the final 18 players on Day 2 of the $500 No-Limit Hold 'em event. The feature table is now streaming live at FoxwoodsLive.com. To watch the feature table, just click here. Event #7, the $400 Pot-Limit Omaha High, is now underway. Players start with 10,000 in chips and the levels are 40 minutes in length. Registration and re-entry are available through the end of Level 6. Day 2 of the $500 NLHE Underway with Pete Campo Leading the Field! Day 2 of the $500 No-Limit Hold 'em event is now underway at the Foxwoods World Poker Finals. Peter Campo leads the field with 410,000 coming into Day 2. 28 players started play on Day 2 with the final 27 finishing in the money. We are now down to 24 players with Campo still leading, now with over 460,000. The final table will be live streaming later on today. $500 No-Limit Hold 'em Seniors Event Underway at the World Poker Finals! Event #6 at the Foxwoods World Poker Finals, the $500 No-Limit Hold 'em Seniors with Re-Entry, is now underway. Players start with 20,000 in chips and the first 12 levels are 40 minutes in length. Each level after that will be 50 minutes in length. Registration and re-entry for this event is available through the end of Level 6.